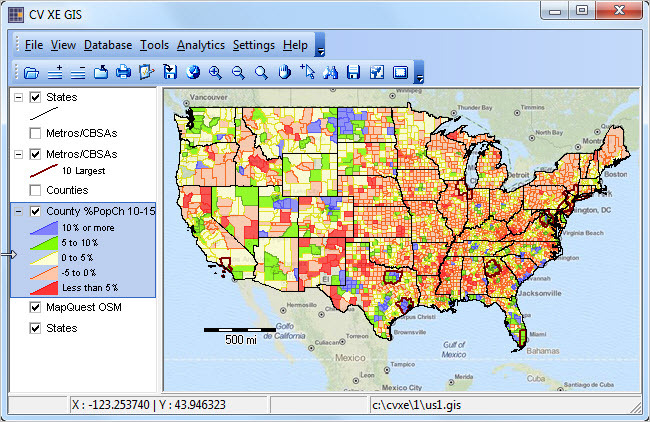 .. mapping and analyzing county business patterns by type of business … this section reviews use of tools and methods to develop custom U.S. by county business patterns data by type of business and develop mapping and related GIS applications. Steps illustrate how to develop a U.S. by county business patterns dataset for the supermarket industry — NAICS type of business code 445100. Use the interactive table in this related section to examine supermarket business characteristics by county. 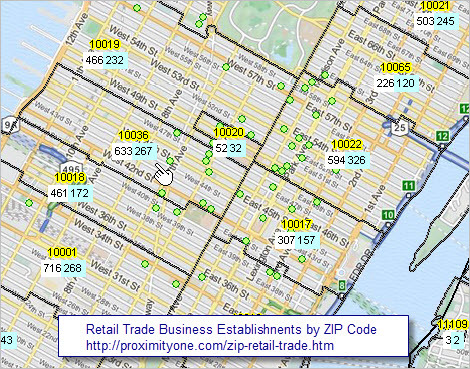 Create map views such as shown below and perform wide-ranging business patterns data analytics using the tools. Develop similar applications for any type of business – see full list of NAICS/type of business categories. This section is focused on Census-sourced County Business Patterns released April 2016. There are additional data resources that can be used in a similar manner reviewed in main Web section. 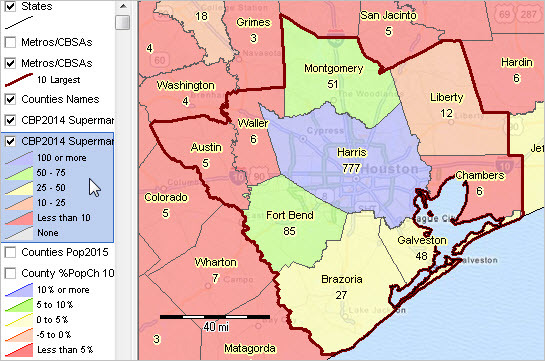 The following graphic shows patterns of the number of supermarket establishments by county for the Houston metro (bold boundary) region. Counties are labeled with the number of supermarkets and county name. Number of supermarkets shown by intervals/colors as depicted in legend panel at left of map window. 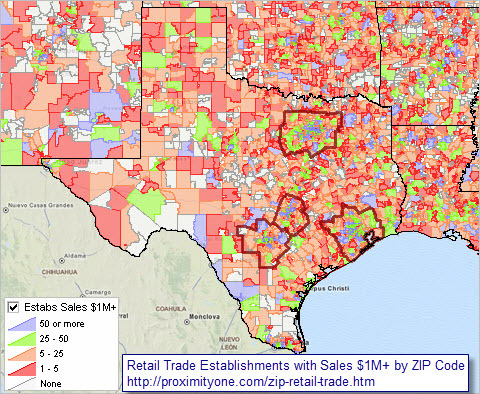 Create custom maps similar to this view for your regions of interest depicting establishments, employment or payroll for your type of business selection(s). Click graphic for larger view with more detail; expand browser window for best quality view. View developed with CV XE GIS software using GIS project. See full Web section to access data, tools and more detail. .. expanding insights through data analytics .. a new CV XE GIS start-up project, described in this section, is now part of the CV XE GIS installer. The latest GIS project uses U.S. national scope shapefiles newly developed as of April 2016. You can immediately start using this GIS project in a production manner. See more below. Join in the weekly Data Analytics Lab sessions where structure and use of this project and shapefiles are discussed. See the Web version of this section. Join the ProximityOne User Group and start using the new US1 GIS project — included with all versions of CV XE GIS software. 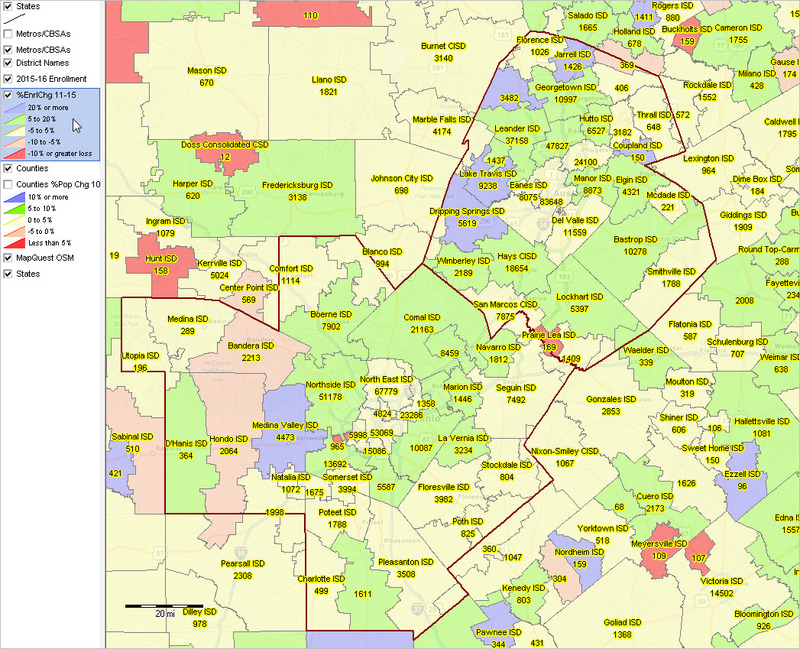 National scope state, metro and county layers are all active upon start-up. States are transparent showing only boundaries. Metros/CBSAs reflect a query that has been set to show only the largest 10 metros (based on 2015 population). The county layer shows a thematic pattern map of the population percent change between 2010 and 2015. 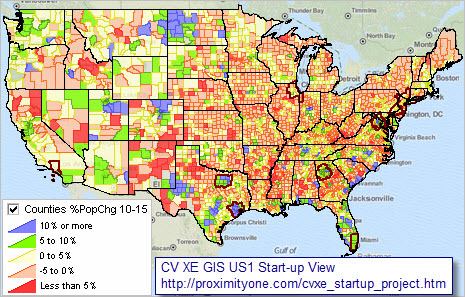 The start-up view shows a thematic pattern map of percent population change, 2010-2015. Click graphic shown below for a larger. more detailed view. Expand browser window for best quality larger graphic viewing. 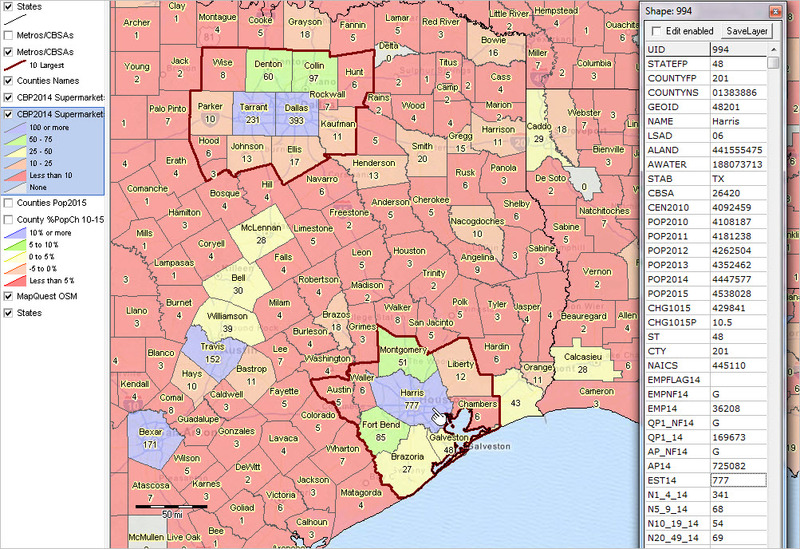 • each shapefile includes integrated Census 2010 population and annual population estimates 2010 through 2015.
the layer being displayed in the map window. 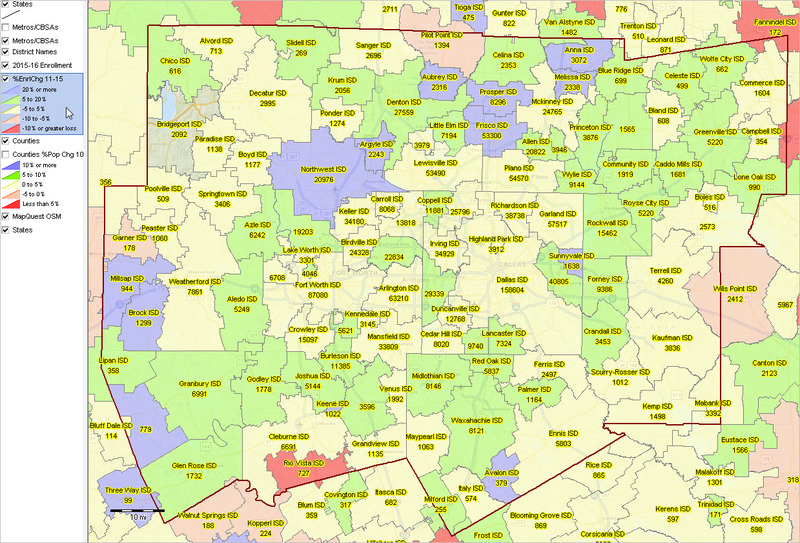 The metros and counties layers are included twice; the upper, unchecked, layer is set to show area names as labels. • Use the navigation tools to zoom to an area of interest. 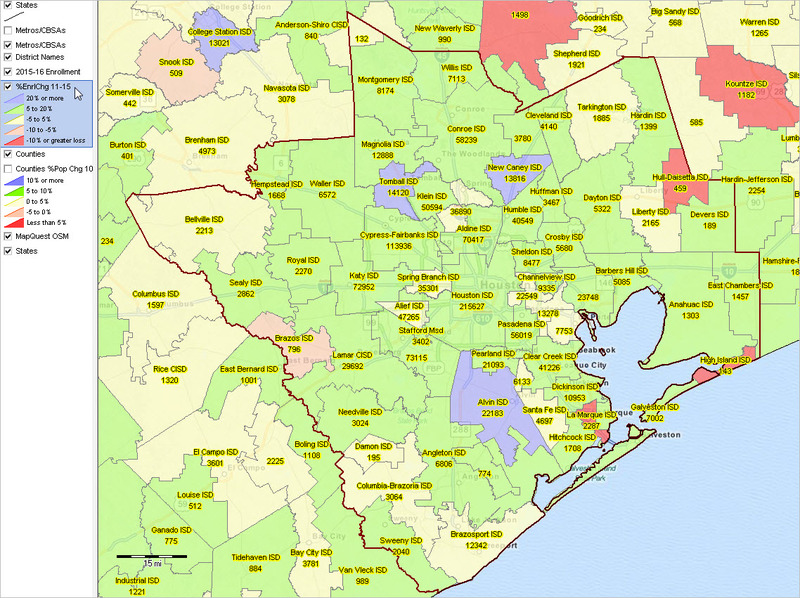 .. for example, zoom-in to the Houston metro (click for larger view). • Determine which counties, metros or states are changing most rapidly. .. and how they are changing. • Use the latest official population estimates. 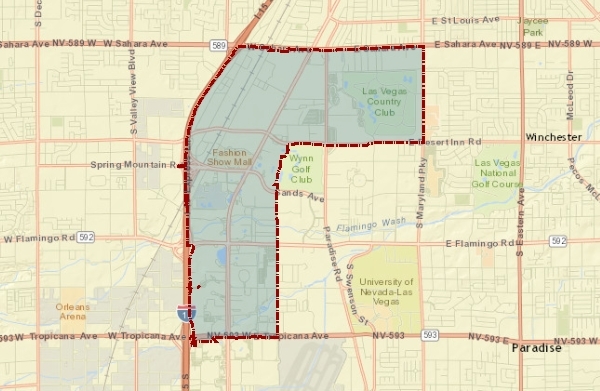 • Easily compare county components of a metro to total metro. 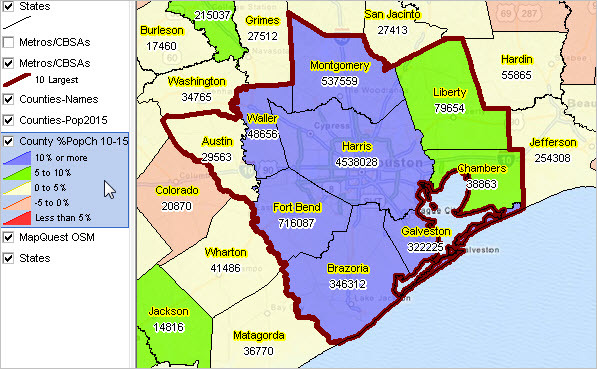 .. for example, zoom-in to the Houston metro (any metro). • Use layer editor tools to add labels, modify intervals/colors, change/add patterns and more. .. for example, check-on the county labels layer to easily view county names..
• Add other layers showing different types of geography and subject matter. 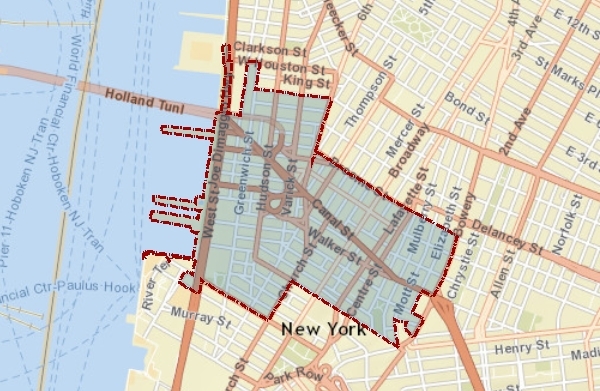 • Integrate other types of subject matter into the existing shapefiles. .. examining the how, why and where of population change by state from 2010 to 2015. 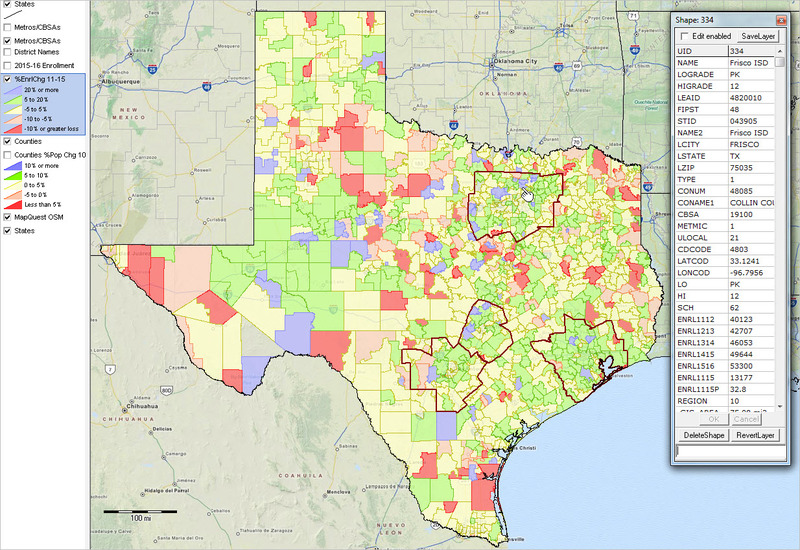 This section provides an overview of this topic and provides a summary of tools, interactive table and GIS project, to analyze population change by state by county, using latest Census Bureau estimates data through 2015. These data are used by ProximityOne to develop/update annual national state and county demographic-economic projections. See schedule of related 2016 updates. See more about development of these data/reports below. Updates … see related State and Regional Decision-Making Information section … frequently updated state-by-state pages. 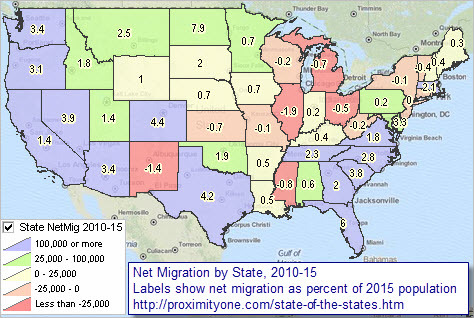 The following graphic shows patterns of state net migration during 2010 to 2015. 14 states experienced negative net migration. See in table below. States are labeled with net migration 2010-15 as a percent of 2015 population. Click graphic for larger view; expand browser window for best quality view. Population change can be examined in terms of components of change. There are three components of change: births, deaths, and migration. The change in the population from births and deaths is often combined and referred to as natural increase or natural change. Populations grow or shrink depending on if they gain people faster than they lose them. Examining a region’s unique combination of natural change and migration provides insights into why its population is changing and how quickly the change is occurring. Click a state link to view a state by county profile. For each state, eight tables of population change are presented. Each of the eight tables shows characteristics of each/all counties in the state in addition to state overall. .. to examine patterns in states of interest. The following interactive table graphic shows the 14 states that experienced negative domestic migration during the period 2010-2015. See full full interactive table. Click link for larger view.